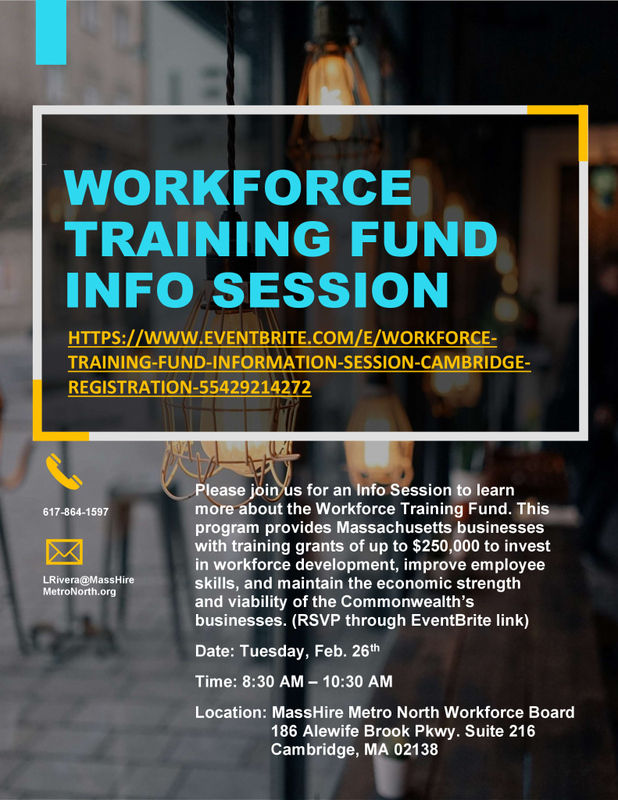 Businesses are invited to the Workforce Training Fund Program Information Session that we are hosting at the MassHire Metro North Workforce Board in Cambridge on Tuesday, Feb. 26th from 8:30am-10:30am. Note: All Massachusetts for-profit businesses, and those non-profit businesses who pay Unemployment Insurance on a quarterly basis contribute to the Workforce Training Fund and are eligible for this training. If you are aware of any businesses who want to attend, please be sure they understand the eligibility criteria and advise that they check with their payroll department if they are unsure. For further eligibility questions, contact wtfp@commcorp.org.